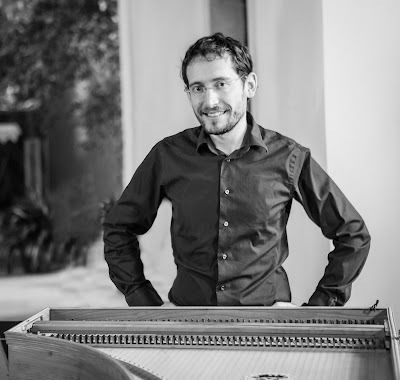 A couple of years ago, my family discovered the work of Israeli-born and Basel-trained early music specialist Elam Rotem (b. 1984), a keyboardist and singer who founded and directs the splendid vocal ensemble Profeti della Quinta (Prophets of the Perfect Fifth — a very Augustinian and Boethian name). Moreover, Rotem runs a delightful website called Early Music Sources, which contains superb educational videos on such questions as 17th-century monody, historical pitch, cadences, high clefs and transposition, Italian basso continuo, tuning and temperaments, tactus and proportions around 1600, the romanesca, improvisation, and intabulations. Rappresentatione di Giuseppe e i suoi Fratelli (Joseph and His Brethren). Musical drama in three acts, composed in the spirit of the early operas (2014). The links at Amazon include samples of all the tracks. Naturally, such a countercultural but brilliantly successful endeavor is of immense interest to me, and I would think to many NLM readers, since those of us who celebrate or assist at the usus antiquior are promoting a liturgy (and its musical repertoire) that embraces the ancient, medieval, Renaissance, and Baroque periods, yet remains present among us down into our own times, and is still being enriched with new works of art — be they new churches, new vestments, new furnishings, or new musical compositions in Latin. For us, too, old forms of art are still alive, and that which may seem to some to be “dead” has never ceased to be the living language in which we worship. I asked Mr. Rotem if he would be willing to do an interview for NLM about his work in the ongoing (and evidently burgeoning) early music revival. He graciously consented. Peter Kwasniewski (PK): Mr Rotem, thank you for sharing your time and expertise with readers of New Liturgical Movement. We are interested in the question of the continuing relevance of the past to the present, particularly in the use of ancient religious rites, languages, and art forms. Music is frequently discussed in so-called “traditional” Catholic circles, above all the extensive use of Gregorian chant and Renaissance polyphony, which are treasures of our heritage. So we are well-disposed to the work you are doing. You have written some magnificent music in a late Renaissance or early Baroque style. How did you end up coming to this style as opposed to an earlier or later one? What is special about the early 17th century in your eyes and ears? Elam Rotem (ER): The period around 1600 is unique in music history. New ways of composition, which are almost opposite to the ways in which music was composed until then, were invented and used. The concept of a single soloist that is half-singing and half-reciting (recitar cantando) and accompanied by simple harmonies, made it possible to tell stories in an immediate and dramatic manner. In addition, composers were exploring new harmonies that were not used before, and took the liberty to do so based on the texts that they were setting. If the character of the text was soft and sweet, so was the music. But if it was harsh, they didn’t mind composing harsh music that was intentionally unpleasant. The music’s main purpose was to amplify the text. Such stylistic environment is great for communicating emotions to the listeners, and especially for storytelling. PK: Strikingly, your works are composed in Hebrew, which is not a language that has been much used for choral music intended for Western European and American audiences. 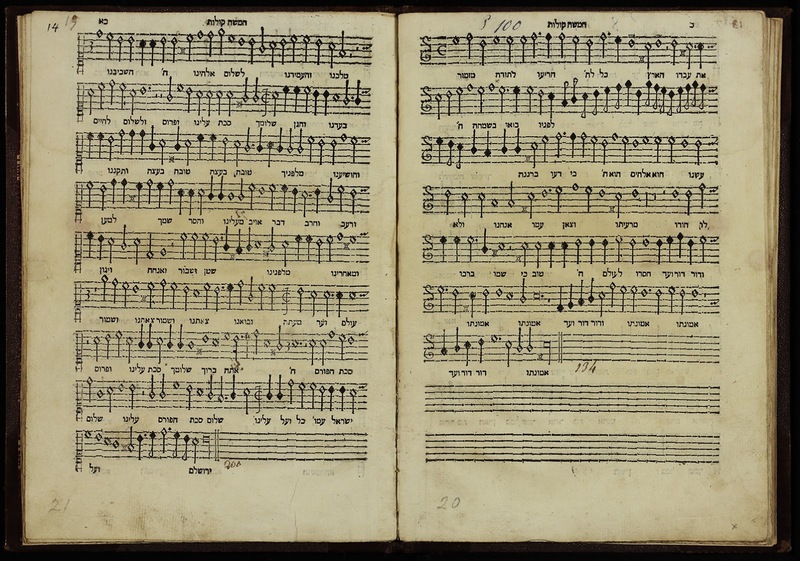 What’s it like to set Hebrew in a musical style whose main languages were Latin and Italian? Do you have precursors or models you can look to? Do the Latin versions of texts from the Hebrew scriptures and their historic settings influence your work with the original language? ER: I was inspired by the Hebrew psalms of Salomone Rossi (1622). Rossi, on the one hand, was a “normal” court musician, playing and composing instrumental and secular vocal music. He worked at the Gonzaga court in Mantua together with Claudio Monteverdi, and took part in Monteverdi’s productions. On the other hand, he also attempted to introduce Western/Christian musical traditions into the Synagogue. His Psalms and prayers in Hebrew were meant to be performed as part of the liturgy. Rossi was the first to bring such an idea to life and to print music in Hebrew. 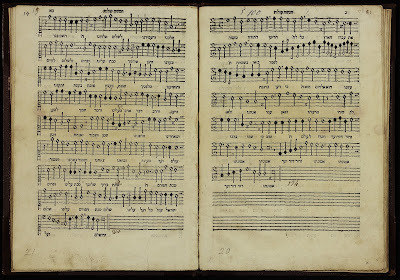 When trying to fill the big gaps in Rossi’s biography, I imagined how, in addition to his rather conservative liturgical works, he might have also composed some dramatic works in Hebrew for some special holidays, and how such works had little chance of survival, as the only surviving documents related to Rossi are his Venetian musical prints. When composing, I had much pleasure working with the original texts in all their untranslatable beauty. Composing biblical Hebrew in stille rappresentativo is quite different from the motet style of Rossi, so I had to find my own way of doing so. The accents of the words in Hebrew are typically on the last syllable, which proved to be quite a challenge when trying to make the text flow in a recitar cantando manner. PK: You have composed many works from biblical texts on love (Quia Amore Langueo) and have written a veritable oratorio on the story of Joseph (Rappresentatione di Giuseppe e i suoi Fratelli). What attracted you to these parts of the Scriptures, and in general, is there something you are looking for when you choose your texts or themes? ER: I composed Joseph and His Brethren first. I love the story, and I love how the original text tells it; very condensed and to the point, in an almost dry manner. So when suddenly a touching or poetic moment occurs it is amplified by the contrast to the other drier parts and the result is very moving. It was an enjoyable challenge to use this biblical text as a kind of libretto and bring the story to life. Apart from Joseph and His Brethren, in Quia Amore Langueo there are also some dramatic scenes (“Amnon and Tamar” and “Samson and Delilah”), as well as poetic motet-like texts from the Song of Songs. What I loved about the Song of Songs is the colorful texts full of images and contrasts — very appropriate and similar to the texts used around 1600 in general. PK: Do you think it would be legitimate to compare the nation of Israel’s revival of Hebrew as a spoken language, when it had more or less been extinct, with your revival of Baroque musical language? ER: This was suggested by Barney Sherman in an article about my compositions. I will just comment that I didn’t make a “revival of the Baroque musical language,” I merely took one more step on the same path that the early music scene was taking: instead of only adding ornaments or parts to existing compositions, or improvising pieces, I did a bit more. And I’m certainly not the only one; for example, Guido Morini performed and published his Baroque opera Solve et Coagula. PK: Naturally, there will be critics who wonder how it is possible to “express oneself freely as an artist” if one must adopt the strictures or constraints of a certain musical style. What would you say to those critics? ER: Art was and is always based on constraints. I don’t believe it’s important which constraints you use. As a performer and researcher, I did (and do) all that I can in order to “feel at home” with the music of around 1600. I’m playing this music for a living and this is my primary musical language. If I want to create and not only execute music, I will naturally use the language I know best in order to do so. PK: I guess I would also ask the “inverse” of the last question. Modern art has boasted about “originality” for a long time now, but to be realistic, we do not seem to be living in an age of many great composers and great masterpieces. Do you think the modern idea of creativity or originality — that we must always be seeking something “new” — has something to do with our lack of worthy output? ER: I do believe in the concept of “something new,” but on a smaller scale. It was not different in past periods: for example, Monteverdi composed a madrigal based on texts that had already been used by other composers, but there was still a place for his version — a new version of the music — although the text, musical language, and medium were the same as in other existing compositions. I think that the difficulty starts when the musical language and the medium must also be reinvented by the composer; it’s as if every time we want to say something we would have to invent a new language. Even assuming that the invented language is coherent and contains inner logic, it could be compared to trying to communicate using a language unknown to one’s interlocutor; if the listeners don’t understand the language, their experience is limited because they lack a stylistic frame of reference. My focus on the style of the early 17th century frees me of this concern, seeing that composers of that time were bound to specific stylistic conventions. PK: You and your colleagues in Basel are dedicated to the art of paradox: early music played in the contemporary world, on new instruments of period design. Can a historic musical style speak to moderns with the same “grammar, logic and rhetoric” with which it spoke to its original audience? ER: I can’t know how the original audience experienced the music. I do know that around 1600 musicians were interested in expressing human emotions and moving the hearts of the listeners, and I believe that this can still be done today. PK: Would you say that the qualities of early instruments are a major influence on and inspiration for your desire to compose in this style? Which comes first, the style or the instruments? Does something as subtle as the tuning system — which, as we know, went through so many variations in Western history — also influence your compositional voice? ER: Instruments and temperaments are just certain details in the whole picture. They are important and inspirational, and it’s a good place to start (indeed this is how the early music movement started), but they are not the essence. The essence is the understating of the musical language, and in the case of dramatic music, the communication of the text and emotions. PK: Our times have seen a remarkable increase in the use of male vocalists (altos, countertenors, falsettists) for parts that (outside of English choir schools) were conventionally given to female altos and sopranos. What do you think of this development? What motivated you to choose only male singers? ER: Indeed the period around 1600 is the beginning of the inclusion of female singers in performances; before that period, one can say that generally music was performed predominantly by males. Most of the repertoire we are singing in Profeti della Quinta was probably performed by male singers, but we do include female singers sometimes (and definitely female instrumentalists). Otherwise, since this is the ensemble I’m working with, I composed the pieces especially for its singers, and tailored it to their abilities. This is, by the way, yet another aspect of historical composition, since baroque composers often composed a part with a specific performer in mind. PK: How has your work — your compositions and the playing of your ensemble — been received in the early music world at large? Of course, early music specialists learn to improvise (and organists have never stopped doing it), but do you see any other musicians beginning to compose in the early Baroque style? ER: My works were received warmly by the public, but with mixed feelings by some critics. It is always much appreciated, but some (especially musicologists but not only) still are not sure if such a thing is a “legitimate” work of art. I obviously think it is, and the public in the concerts seems to agree. By the end of 2018 Joseph and His Brethren will be performed for the fourteenth time and more performances are planned in the future. I think that this is not bad for a piece composed in the 21st century, in which many of the newly composed pieces are only performed once… As I mentioned above, there are other musicians in the early music scene that are doing similar things, but perhaps not on the same scale. PK: Where have you found your work best received? ER: Whether it was just one or two small pieces, or the complete Joseph and His Brethren, my compositions have been well received everywhere we perform them. Naturally, because of the language and cultural relevance, the performances in Israel were received with even more appreciation. As I mentioned above, when the human emotional experience is in the center of attention, it can and does speak to a wide public. PK: Do you ever compose in other styles, whether earlier or later than the early 16th-century idiom? If so, will you share those works with your public, or are they just for private use? Are you working on any big projects at the moment, either of composition or of recording? ER: Up to this time, I haven’t composed music in other styles. Unless I would also perform and research music in other styles, I don’t think I would compose in them. My intention is not to imitate music from other periods, but to express myself in the language I know best. 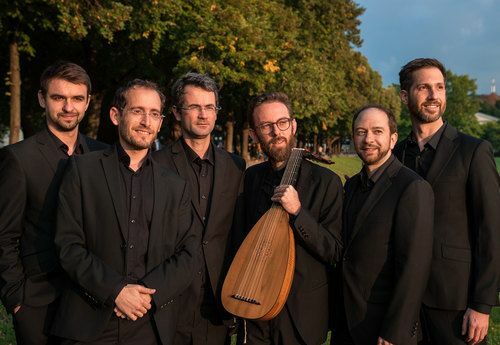 At the moment I’m not working on any new compositions, but some new CDs of Profeti della Quinta are coming out soon: Psalms by Alexander Utendal (ca.1530-1581) and a collection of madrigals (Amor, fortuna, e morte - Madrigals by de Rore, Luzzaschi, Gesualdo & Monteverdi). I would like to express my thanks to the composer for this interview and for sharing the gift of his music with us. A final thought. The philosopher Charles Taylor is famous for claiming that modern man, who is a conscious and free self negotiating a world of optional beliefs and engagements, is forever cut off from the “enchanted cosmos” of pre-modern man, who naively saw himself as dwelling in a world of spiritual realities as real as, or more real than, material ones. We moderns are irreducibly different — there is “no way back.” I would think that a confirmed Taylorite would consider Rotem’s enterprise impossible, or merely academic or parodical. And yet, it only takes a pair of functional ears to discover that it is no such thing: it is eminently possible, convincing, passionate, and powerful. Crucially, it is experienced immediately and intuitively by those capable of understanding music; in other words, not as the result of a “lifestyle choice,” as Taylor imagines religion must now be, thanks to our awareness of alternatives. Might this give us a reason for thinking that the art of music is one way of refuting the thesis that naive access to an “enchanted cosmos” is no longer available to us, that we are cut off from our premodern ancestors? Please visit my new personal website, www.peterkwasniewski.com, for news, information, article links, sacred music, and the home of Os Justi Press.